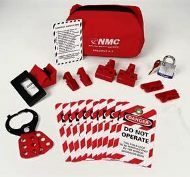 Lockout pouches are personal lockout kits for individual use. They’re for workers on the job that need access to lockout supplies when servicing and maintaining equipment. The pouches are small enough to easily carry from place to place in order to always have access to locks and tags. Switches, circuit breakers and machinery need to be locked and tagged in order to keep equipment from accidentally being turned on during servicing and maintenance.